We arrive into Berlin to rain, almost the story of our trip. Google Maps told us it was a bus, a train, then another train to get to our accommodation in Kurfürstendamm. 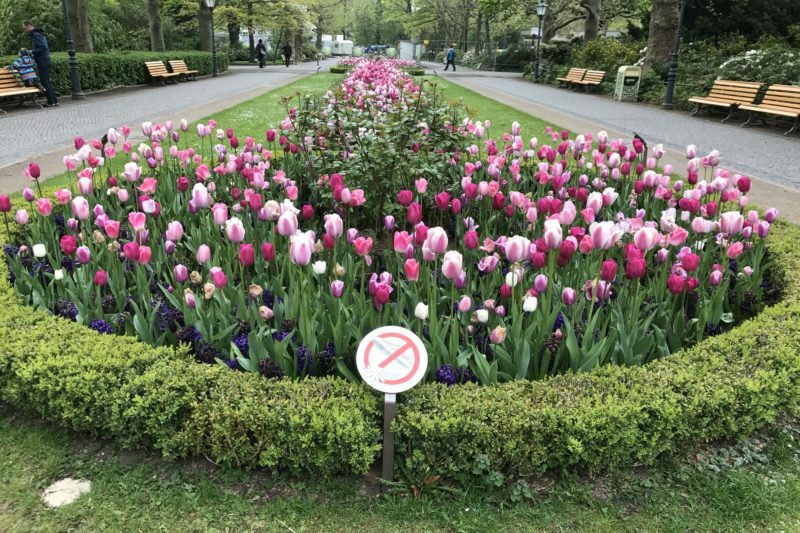 After our recent brush with inspectors in Paris, we were particularly keen to ensure we got the right tickets this time. The task proved impossible. We couldn’t find any information, and eventually made our way outside to the bus stop hoping for ticket machine there. No machines, but the bus was there so we jumped on to ask the driver. Simon went to pay, but we didn’t have a small enough note and the driver waved us onto the bus. Another free ride! With trepidation we emerge from the metro station at our destination. Sure it might be raining, but we immediately like the area. Our hotel is only a few metres away too, so no lugging our heavy packs too far. It really will be fantastic when we send all our heavy winter gear home with our kids and our load becomes lighter. What a sigh of relief when we opened the door to our rooms here. The Scandic Hotel is considered a mid-range hotel and seems to be mainly geared towards the conference market. We had two rooms with big comfy beds, and bathrooms you COULD swing a cat in! After our obligatory visit to the local grocery store for snacks and drinks, we spent the night in, enjoying the comfort. For our first morning in Berlin I had already arranged a walking tour with Urban Adventures. 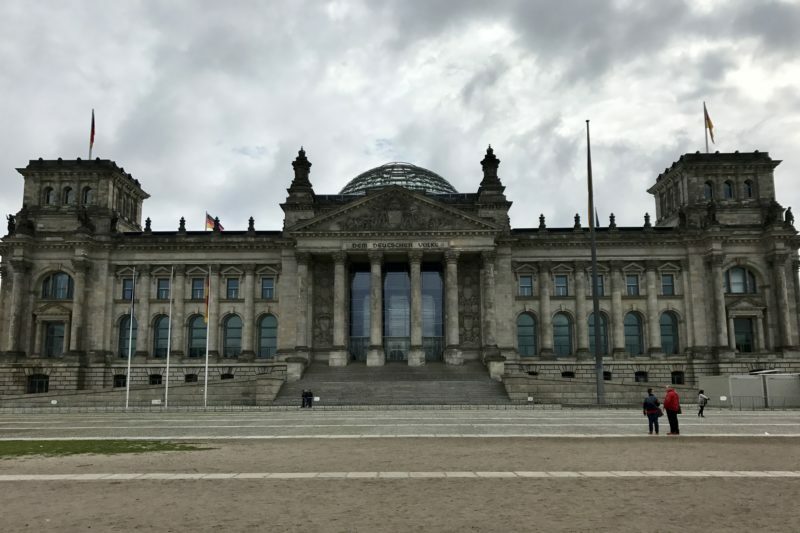 Our guide met us in front of the Reichstag building (the German parliament) and we spent about three hours walking through the central part of Berlin looking at some of the landmarks. 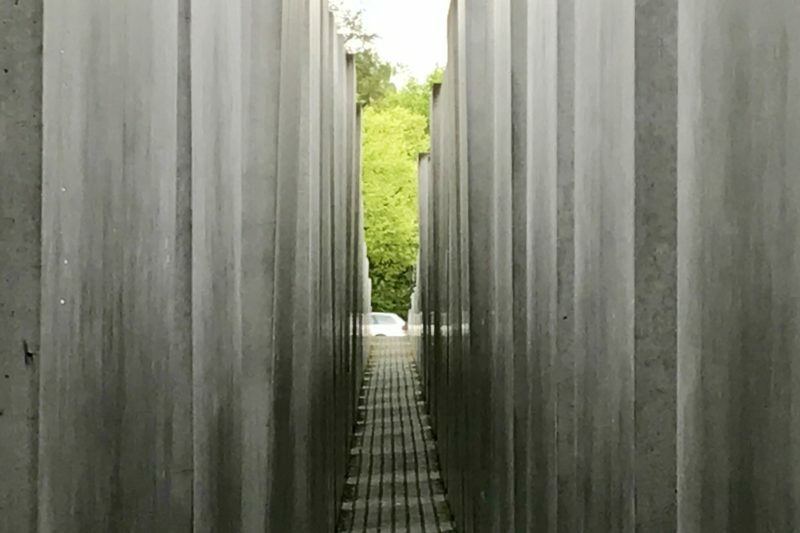 We saw Brandenburg Gate, the Holocaust Memorial, Checkpoint Charlie, one section of The Wall still standing, and many other historical points of interest. 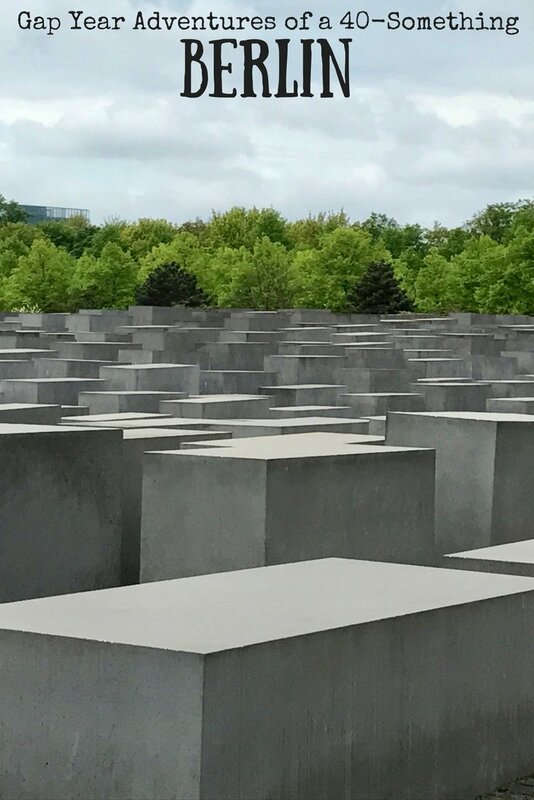 Apart from walking through the Holocaust Memorial, we didn’t go inside any of the attractions, our guide just gave us some background information to allow us to decide if we wanted to visit later at our leisure. Reichstag on a very grey morning. The new glass dome has been added to symbolise transparency of government. It is possible to go up into it to see the view. Overall the tour was exactly what I was looking for. 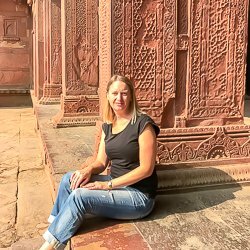 It allowed me to get my bearings, and get some information about Berlin’s history and places we may want to visit later. I was really surprised to see how close The Wall came to the Reichstag. 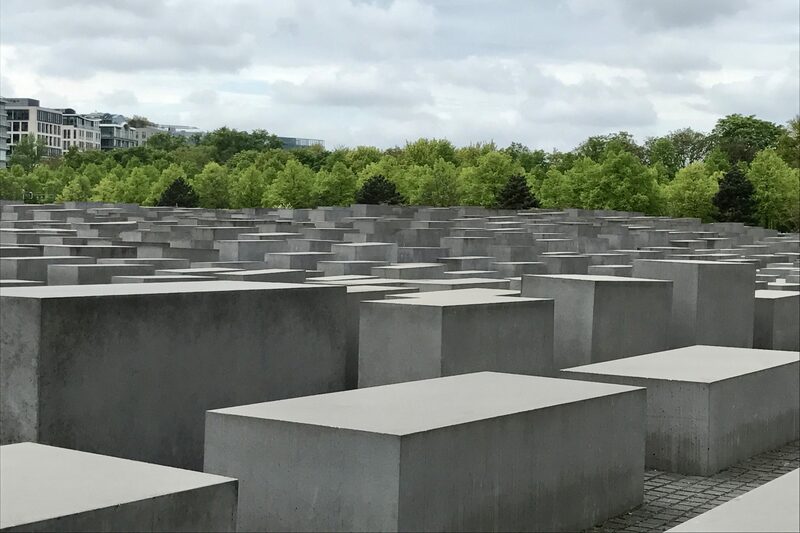 And the Holocaust Memorial, as our guide said, is all about how you feel inside it. I was surprised, because I didn’t realise is was so big, or any of the blocks were so tall. While they are laid out in a grid, the blocks themselves sometimes tilt one way or another as you can see in the photo above. Some of the rows have fences across them to contribute to the feeling of entrapment. It’s quite a strange sensation. Something I noticed on our walk were the bears everywhere! Our guide explained that the bear is the symbol of Berlin, chosen perhaps because of the similar sound to their names. 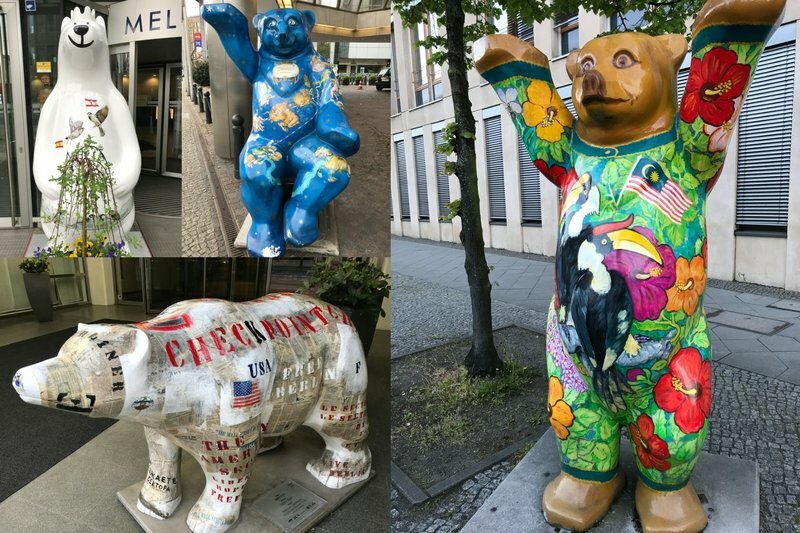 In 2001 an arts program started making “Buddy Bears” and placing them throughout Berlin. Since then hundreds have been made, including over 140 decorated for each nation in the United Nations that have toured the world. Oh, and as an aside, as we jumped on the bus to meet our guide, Simon again went to buy tickets, and this time the machine was broken! We were doing really well with free rides! After our walking tour we walked along the banks of the river to the main train station to book our train tickets to Krakow. I had researched this all in advance, but couldn’t buy the tickets online without a European credit card. Unfortunately I couldn’t buy the tickets at all! Apparently track works are being done somewhere in between which means no trains were available. Or I’m fairly sure that was what the issue was. My German is not so good, and the lady helping us only had slightly better English. 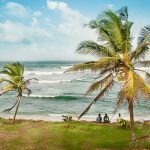 Later, an online search for flights made my eyes water! 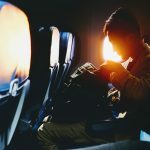 Nearly $400AUD each for an hour’s flight. I guess that’s what happens when it’s a last minute booking! It is times like these that I am so glad I have plenty of different frequent flyer points. 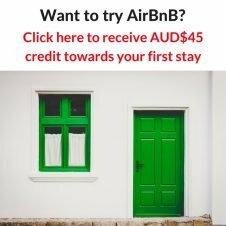 I ended up paying a total of 40000 Qantas points and about $170AUD for all four of us. Definitely worth it in this case. Berlin Zoo and Aquarium was on the agenda the next day. In the past I have really enjoyed going to zoos. Aquariums not so much. I didn’t enjoy Berlin Zoo as much as other zoos in the past. With the education that has become more and more prevalent in recent years, seeing animals caged in smallish enclosures is not as pleasurable as it once was. 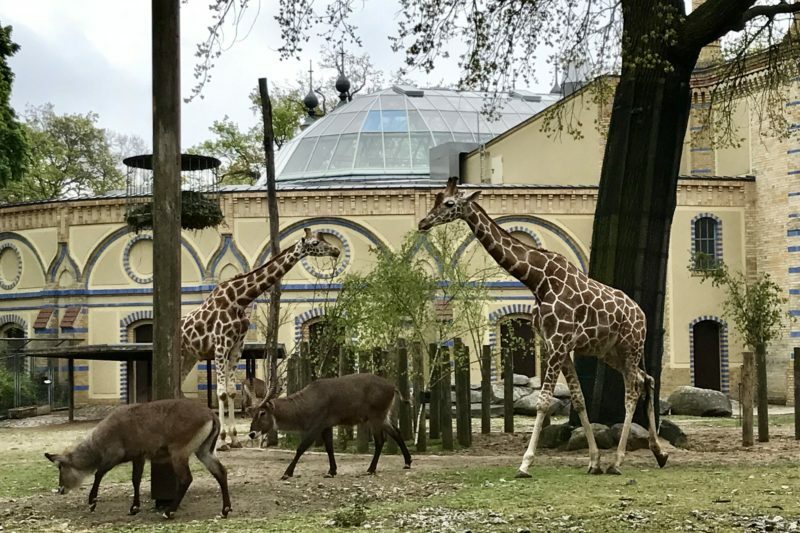 I don’t think this is anything against Berlin Zoo, I don’t think they have bad enclosures or anything like that – in fact some are quite large – it’s just a change in my mindset. Day three saw us back revisiting some of the sites we had seen briefly on our walking tour. Some things were so not what I imagined. I’ve seen movies, I know what the checkpoints in Berlin supposedly looked like. 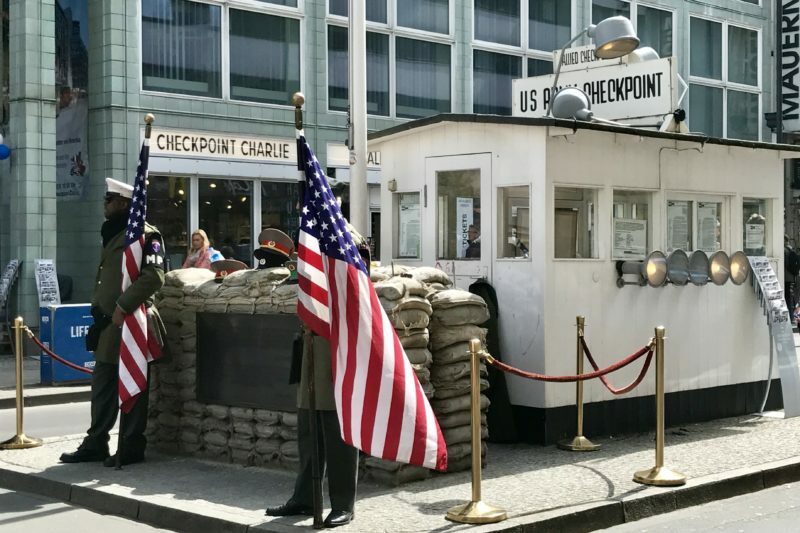 Imagine my disappointment to see that Checkpoint Charlie is basically a little hut in the middle of a main road, with a couple of fake American soldiers on duty for photographs. Checkpoint Charlie. Yes, this is it! Another site that is interesting for it’s anonymity is this normal looking carpark in the photo below. This sits above Hitler’s famous bunker where he supposedly died. 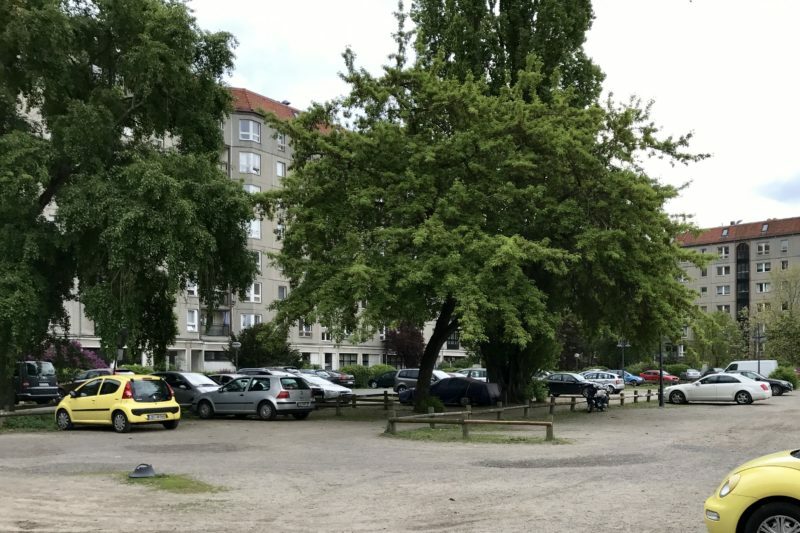 The area has been left like this on purpose and probably won’t be built on any time soon, even though it has a prime location in central Berlin. 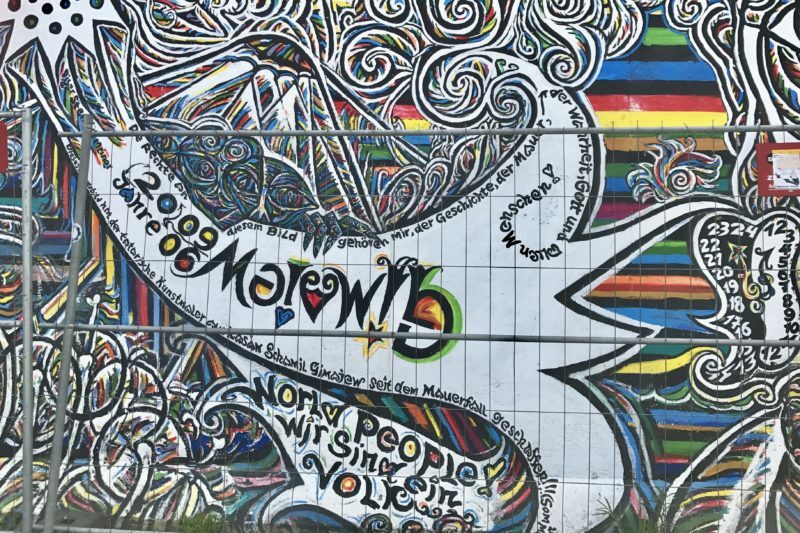 During our walk we made our way to the East Side Gallery, the 1.3km section of the Berlin Wall that has been painted by many different artists in a street art style. I was disappointed to see fences erected in front of most of the wall, but then when we came to sections without the fences we could see why. 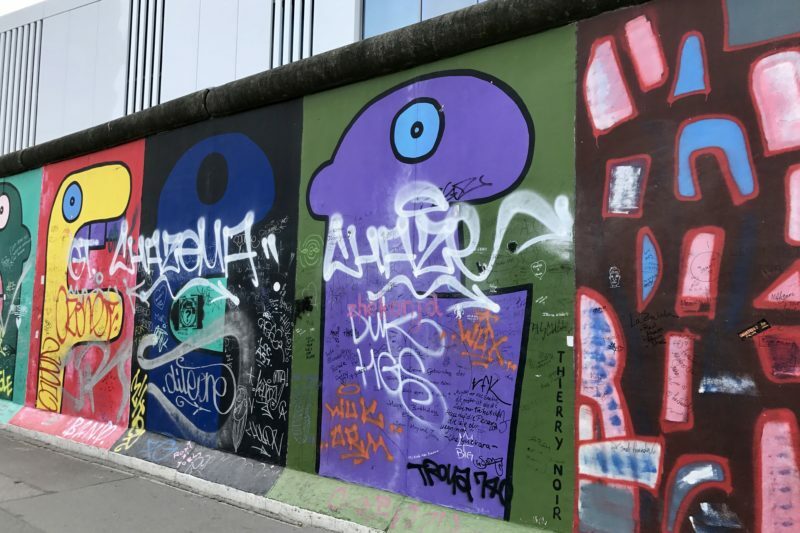 Many others had graffitied over the artwork in those sections. It was explained to me later that the fenced sections were currently being cleaned, and they have to go through this process every few years. Even with the fences though, well worth the effort to get here and have a look. This is what the areas that weren’t fenced looked like. 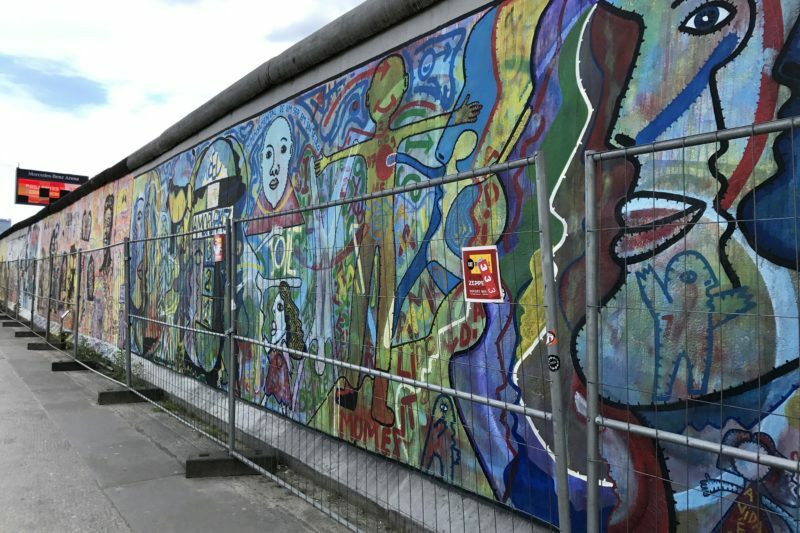 Some of the East Side Gallery art. 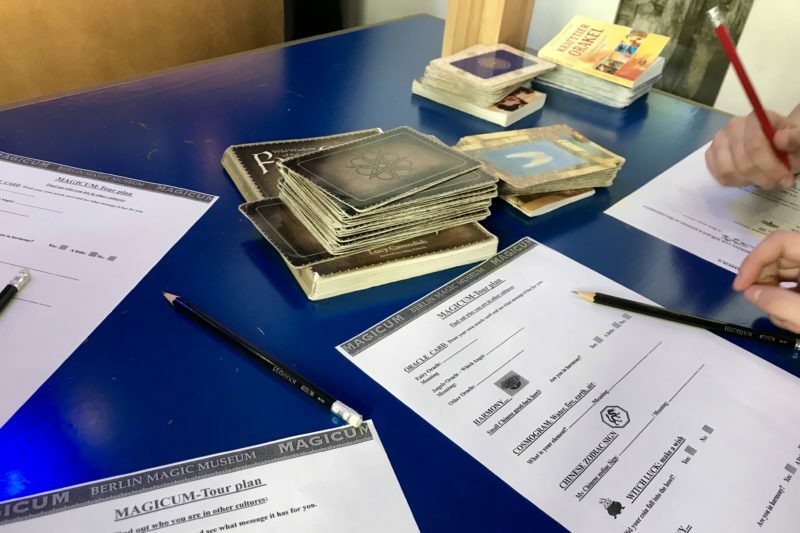 On our travels we came across the Magicum magic museum so thought we’d have a look. It was not at all what we were expecting. It was more about horoscopes and tarot cards and puzzles than magic. Some of it was a little interesting, and it wasn’t a terrible way to spend an hour, but it’s probably not one of the top things to do in Berlin. Tarot cards and questionnaires. Not what we were expecting. Walking back to the metro station, we passed a riverside park I had seen a couple of days earlier. Then it was empty and I had laughed, and wondered who ever came to these places! Now it was Sunday afternoon, the sun was shining, and the place was packed. There seemed to be some sort of dance competition going on and the music and vibe was great. We stopped and watched for a while, and considered staying for a drink, but there were no spare tables so we kept moving. How the park looked the first time I saw it. Not a soul in sight. Now a dance floor has been set up, and the place is crowded! It was a full day of walking, and we saw so many interesting monuments, buildings, a music festival and tourists. We ate curry wurst for lunch, but no stein of beer to go with it. When the sun came out in the afternoon, it was so nice just wandering around. This used to be a library. 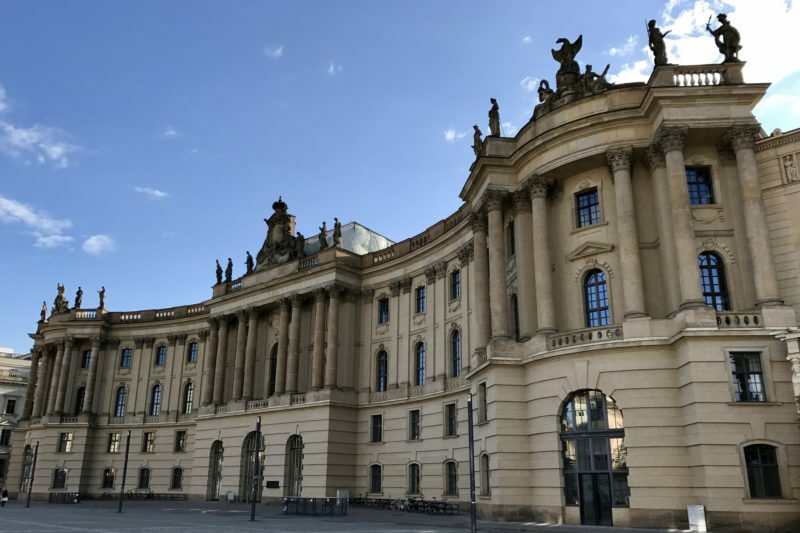 In the courtyard was where the Nazi’s famously burned thousands of books. 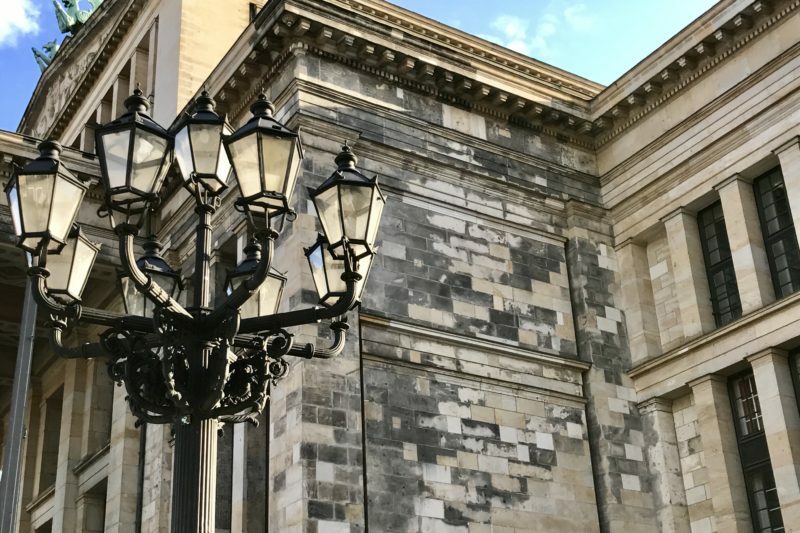 Many buildings in Berlin have areas where it is obvious they have been repaired. Some still have visible bullet holes, mostly left as a reminder. This television tower was built by the East Germans. Not only was it great for TV, but it was a perfect spot to spy on the west. 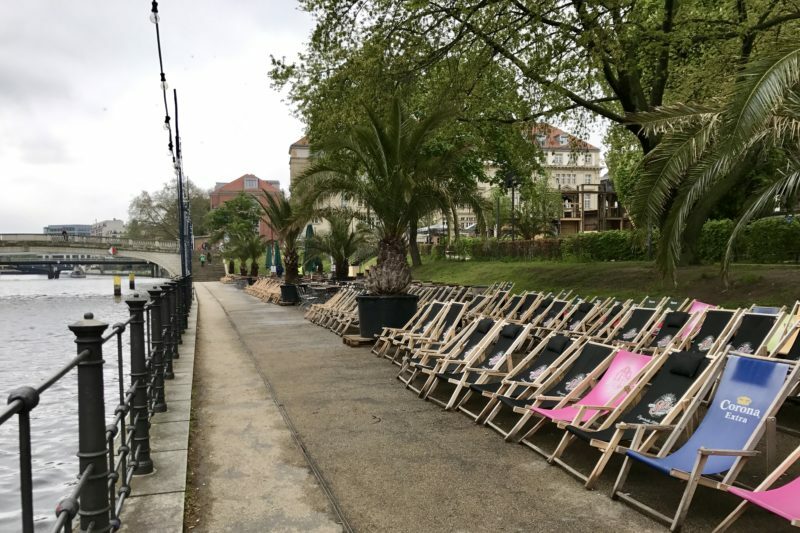 Our final full day in Berlin was spent doing, well, not much! The plan was Simon and Bailey were going to go to the Museum für Naturkunde (Natural History Museum) but then we discovered that it is not open on Mondays. We did venture out into the drizzle in the afternoon so the kids could do some shopping. 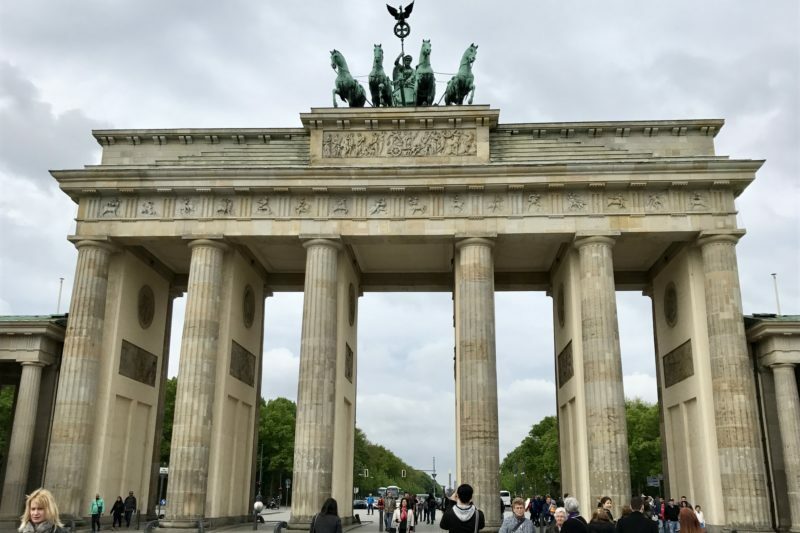 The area we stayed in is one of the best areas in Berlin for shopping, and has outlets of most of the big brand names that we don’t have in Adelaide. We ended up wet and soggy, but the kids got some bargains. My expectations of Berlin were high, and in some respects I got what I expected, and in others I was left wanting more. The weather played a big part in it. It was really cold most days, so hard to get out for extended periods of time. Now that I have been here once I would like to go back again and immerse myself a bit more. 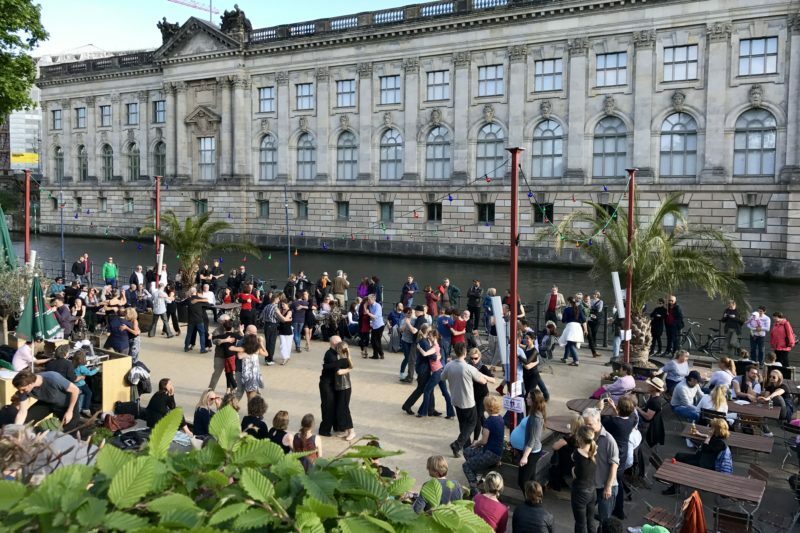 I loved the vibe of the riverbank when the sun came out, and I think Berlin would be a fantastic place to visit in summer. Finally things were cheaper! 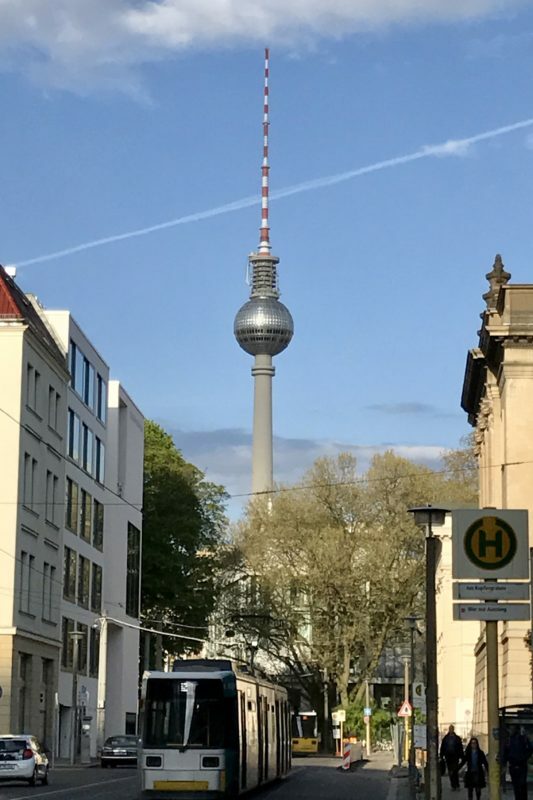 Berlin is much cheaper than the rest of Germany (and where we have been in Europe so far), and we really noticed it, especially when we went to the grocery store for snacks. What was not cheap though was the public transport at €2.80 per ride. We bought the Berlin Card to cover all our transport as well as discounted entry to some attractions. Some days we took up to ten trips on trains/buses. We found wifi plentiful in Berlin. Our hotel was fantastic, and almost every place we stopped in to get food also had wifi available. Wifi was also available in many of the big stores while shopping – a godsend in H&M while the kids tried on nearly everything! One place that DID NOT have wifi though was Starbucks right near Brandenburg Gate. A surprise, because I thought all Starbucks had free wifi! Berlin’s one place I want to visit, for sure. 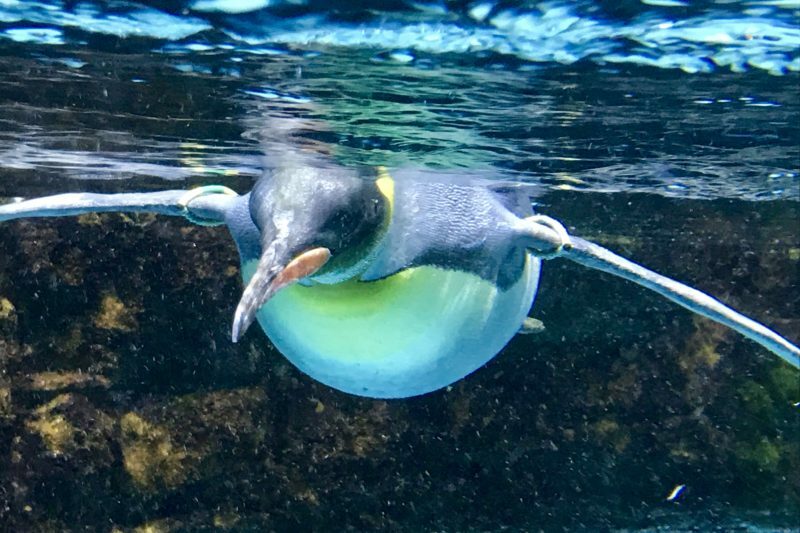 Brilliant photo of the penguin. That’s one for framing. Thanks Pete! I can still notice the dirty glass, but it blends in really well with the water I admit. And for once no reflection. I must have timed it just right! Thanks Carol. 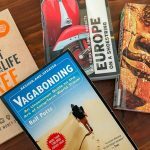 Berlin wasn’t high on my list of places to go – in fact when I started planning Europe I wasn’t even going to go there. 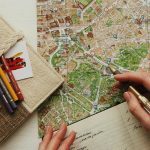 But then I heard from so many people that it was their favourite place to visit in Europe, so I added it to my list. Glad I did, but would love to go back.